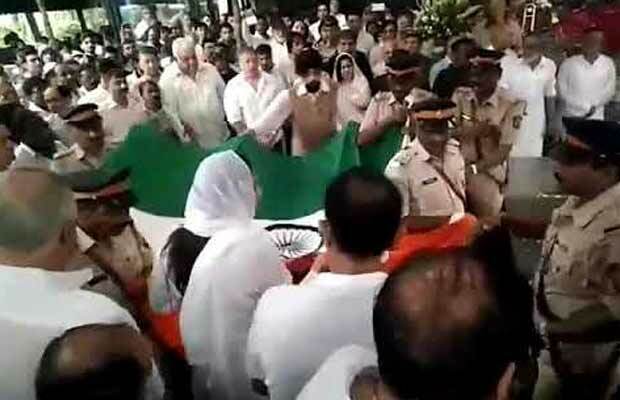 Watch: Shashi Kapoor's Body Draped In A Tricolour, Bollywood Celebrities Bid Emotional Farewell! A tearful goodbye to Bollywood’s legend, Shashi Kapoor. The actor who ruled the 70s and 80s era with his romantic characters, left for heavenly abode on Monday evening. He will always be remembered for his huge contribution to the Indian Cinema. The whole Bollywood industry gathered earlier today to pay final respects to the legend of Indian Cinema. Shashi Kapoor’s son Kunal Kapoor and other relatives carried his body to an ambulance before his funeral in Mumbai, on December 5, 2017. Shashi Kapoor’s body was taken to the Santacruz crematorium from his Juhu home today noon. Bollywood celebrities such including Amitabh Bachchan, Shah Rukh Khan, Sanjay Dutt, Anil Kapoor and others paid their last respects to the actor. Also, seen were Salman Khan’s father Salim Khan, Abhishek Bachchan, Suresh Oberoi, Ranbir Kapoor, Saif Ali Khan, Rishi Kapoor among others. As per reports, about 10-12 policemen draped the Shashi Kapoor’s body in tricolour, which was later removed for the final rites. This was followed by a minute’s silence. He also paid tribute with a three-gun salute in the presence of family and film fraternity. The three-time National Award winner is survived by his children – Sanjana, Kunal, and Karan. Shashi Kapoor, who has starred in more than 100 films, was one of the most handsome actors of 70s and 80s.